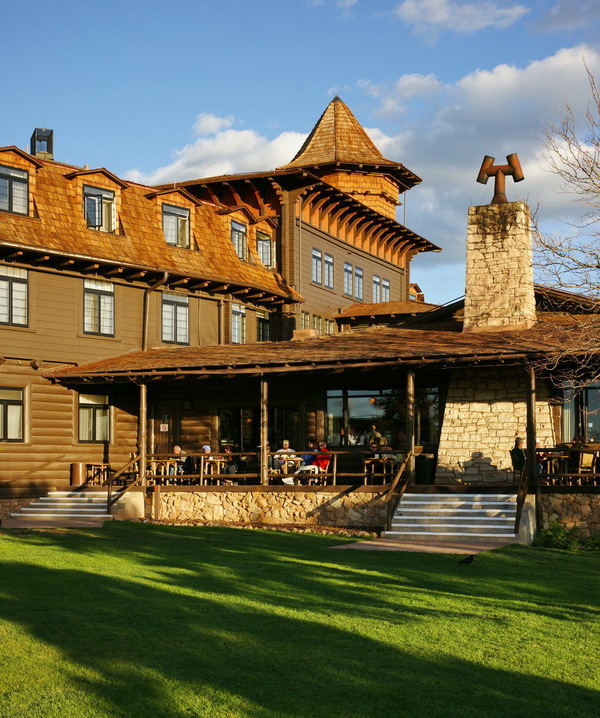 The image below shows the West, or back side of the wonderful El Tovar hotel at the South Rim of the Grand Canyon on a late spring afternoon. A slight vertical crop, and a little shadow adjustment on the porch area was all that was necessary in my opinion. Equipment used; Sony A900 with the Sony CZ 24-70mm F/2.8, @45mm, F/8, 1/200s, -0.70ev, ISO 200. I like the interesting use of different building materials here, like the dimensional lumber above the cut logs on the main hotel, (noticeable at left side of image). Also note the different stone on the chimney and porch stem wall. Anyone see the Blackbird? Check out the weird chimney cap. Check out the long awaited, and highly anticipated Minolta AF 35-80mm F/4-5.6 shutter cap review. The good news is; it's small and light-weight; the bad news; well, maybe you should just check out the review, it's a good way to waste ten minutes, especially if you're bored at work and want a good laugh. The little 35-80mm was a gimmick lens (and of dubious value) that Minolta tried to market in the late eighties. Instead of using quality optics to help generate sales, they opted for a unique sliding shutter-type front lens protector, similar in operation to the Starship Enterprise doors. The marketing pitch was probably something like "you'll never lose the lens cap" etc. It would also make a good conversation piece, if you like conversation. I spent many grueling hours exploring every aspect of this lens, and for my efforts; it produced the worst images I've ever seen from a SLR type lens. You may say "you probably got a bad copy" or whatever, but I've had a couple of readers tell me their copy is awful too! If you want to know what the image looks like when using the maximum aperture, plop a Cokin "Dreams" filter on any one of your decent lenses and you'll get the idea. I used the A900 for this review, (except for the usual A700 macro shot) simply because I didn't want to waste my time providing too much information, and I was just plain lazy. It's hard to get excited about a lens that produces such a veiled mess that you can actually see it by looking through the viewfinder! This lens gets my official, (and first) "worthless" rating. The old Sony/KM 18-70mm kit lens would put this shutter cap lens to shame. 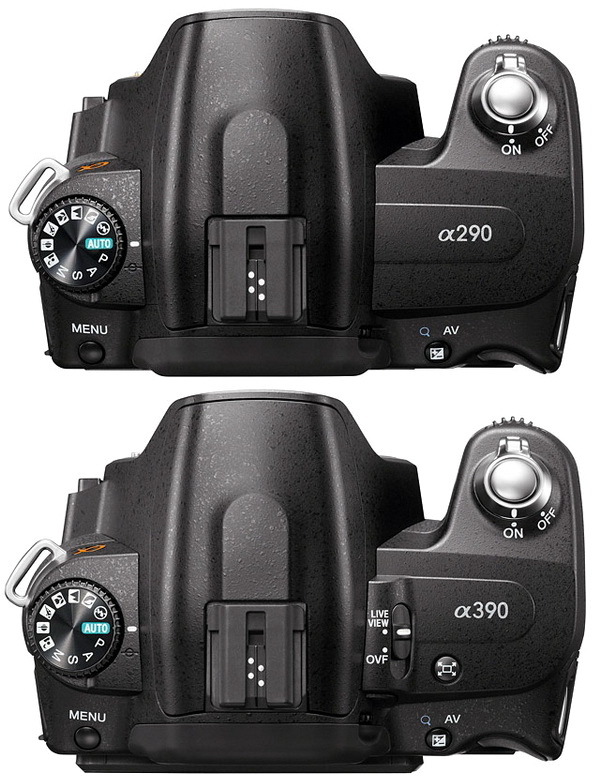 Both shutter cap lenses are pictured below, but only the left one is being reviewed now. I took the product shots together, that way I can save time when getting the Minolta AF 80-200mm shutter cap review ready. Sale ends on select Sony lenses (and cameras) June 19th. For some reason, the Sony website has some of the lenses listed for less than B&H Photo. If you want to get a Sony lens or camera from B&H, tell them to give it to you for the same price as Sonystyle.com and they'll probably do it. They may have the prices mixed up too, they've done that before. I have a feeling Sony may be getting ready for an across-the-board DSLR and accessories price increase, that's my opinion based on past sales events. I have reviews of all lenses listed below, go here for the full list. Below are lenses currently on sale. Sale is over. Check out the comparison between the Sony Carl Zeiss 24-70mm (at 50mm) and the Sony 50mm F/1.4. This is the last comp with the CZ zoom and the primes. The Sony 50mm F/1.4 is definitely superior to the CZ zoom at 50mm, but I don't think that should keep you from unloading your primes and using the CZ 24-70mm exclusively as a landscape lens, at least in my opinion. The CZ zoom is pretty sharp and compares well with the prime when stopped down to F/8. Sony surreptitiously unveils a couple of updated entry-level cameras. The basic differences from each other: the A390 has live view and a tilting screen, and costs $100 more. Both are now 14.2mp. Release date set for July. I'm still scratching my head and wondering when Sony is going to come out with the A700 replacement. I'm reading over my Canon and Nikon camera brochures right now and can't help but think I'll have to bail on Sony for my business related photography, which requires some pro features, but most of the time not 24mp. My nearly three year old A700 has been worn out for about a year now, the control wheels are almost useless, and the AF system is not right. Of course I could use my A900, but why should I burn through one of those every year or two when I don't have too? The image below was taken with the Sony 300mm F/2.8 G SSM, F/11, 1/200s, +0.70ev, ISO 200. 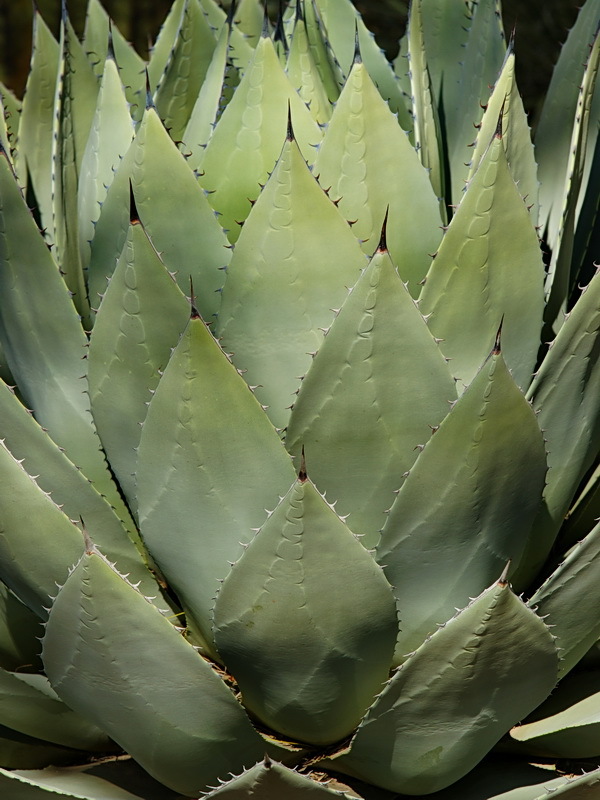 The subject is a quite large Agave plant underneath a tree with shifting light. I like the oddly embossed leaves and dark background. Fully enlarged it looks sharp with nice contrast, but I shot this exact same scene with a cheap Minolta lens and there wasn't too much difference. I made some minor lighting adjustments, and that's it. Fortunately, you don't need a $6000 lens to shoot an interesting scene at F/11. In fact, the Sony 70-400mm would produce a nearly identical image at F/11, and you'd save about $4500. BTW, I took this shot when I was reviewing the Sony 300mm lens, I don't own it. Check out the next comparison, this time with the Sony Carl Zeiss 24-70mm at 35mm, and the restyled version of the Minolta AF 35mm F/2. The CZ 24-70mm compares very well with the older, but very good Minolta 35mm prime lens. So far, the CZ zoom has definitely held its own in most prime comparisons. I have one left, the Sony 50mm F/1.4, so let's hope the 24-70mm is at least close in comparison, then we can dump the primes and use the zoom exclusively. Unfortunately, the trade-off is having to use a big heavy lens, oh well. The two lenses look about the same in the centers, with minor variations at the ends. The mid areas, (approximate APS-C corner areas) are sharper at wider apertures with the Sony CZ zoom, that's a surprise. The extreme corners are sharper with the Minolta AF 35mm at almost all apertures. Distortion is less with the CZ zoom. Ghosting is better controlled with the Minolta prime at smaller apertures. This image was taken at Windy Point, about half way up the Mt Lemmon hwy. 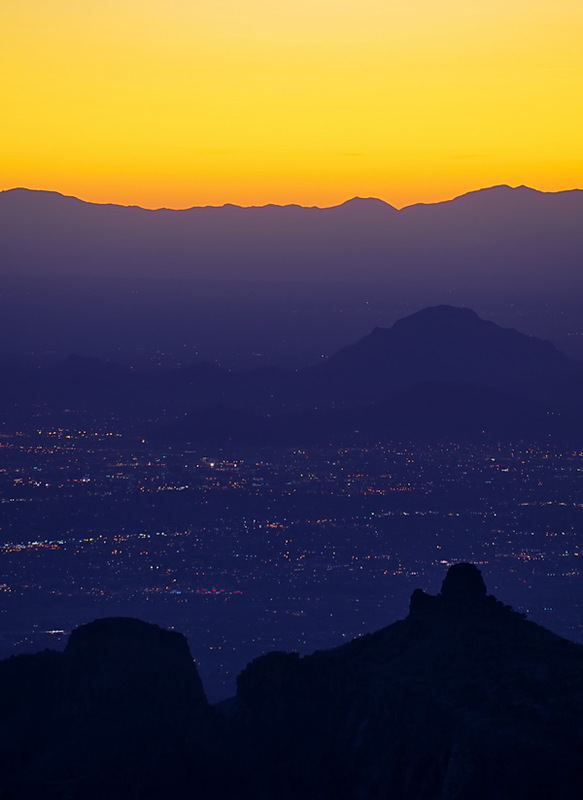 That's Thimble peak in the lower right, and the camera looks west over the city of Tucson. The mountains in the middle (Tucson) are about 25 miles (40km) away, and the last range (Quinlan) is over 50 miles (80km). I used the Sony A900 and Sony 70-300mm F/4.5-5.6 G lens, but I think I could've used the KM 5D with the cheap 75-300mm lens and it would've looked the same. The level of detail from objects 25 miles away through haze and heat shimmer is low, so this image would probably look just as sharp using a 6mp DSLR, and a cheap telephoto zoom. I jacked the colors a little, but that's about it as far as alterations. Shutter speed was 1/3s, ISO 200, F/8 @300mm. Here's another random picture as I wait on the Sony NEX stuff to review, and some more prime comps with the Sony 24-70mm. The image below was taken with the Tamron 28-75mm F/2.8 @35mm, F/32 at ISO 100. I used F/32 to slow the shutter speed (1/15s) and smooth out the waterfall. I forgot my ND filter, so I had no choice. The original image actually looks pretty good, even at 100%, and is probably as sharp as a typical fixed lens camera shot. This image was tweaked with some minor highlight and shadow adjustments, and straightened. 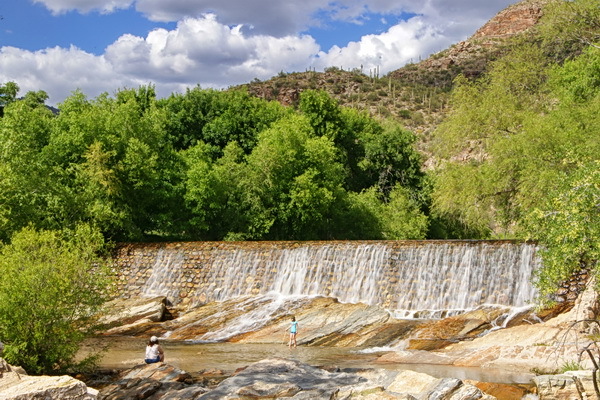 This watery wonderland is the Sabino Canyon Dam, and is only about a thirty minute drive from downtown Tucson, AZ. The Dam used to support a good sized lake for fishing (where the trees are), but now it has long silted in, and is almost dry during the hottest and driest part of the year.